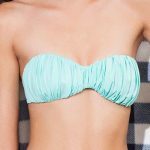 Color Contrasting reversible bikini top. Jade Runner Bralette Top has soft molded cups and corset lace-up ties at back for maximum cleavage and support. Adjustable over the shoulder straps criss-cross at back. Fully reversible.